Red is such a beautiful, strong colour. I love red, but sometimes, in my passion for pink and turquoise, I forget about red. But today red has its moment of glory! 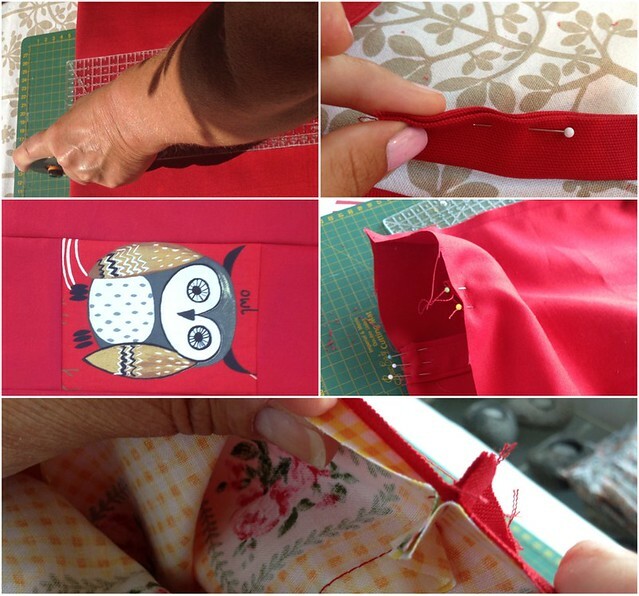 Because we’ve got this Nature Trail Curtain Fabric with a warm red background to the forest animals, and a basic red fabric to match it with… Let’s play! 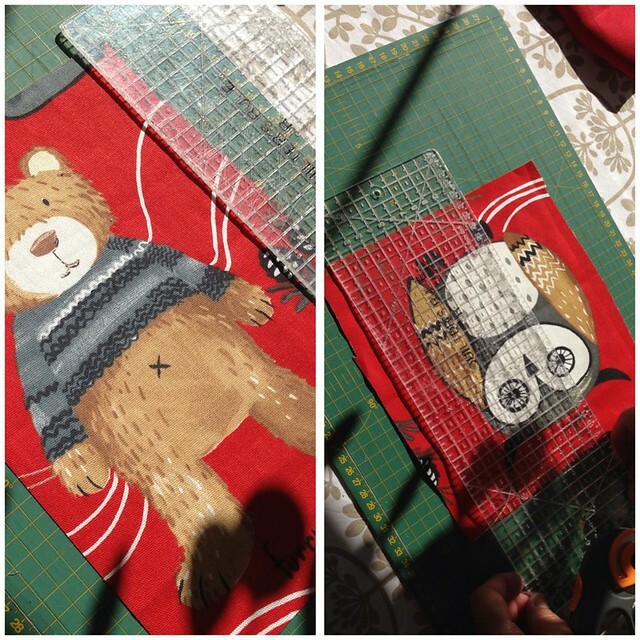 As I already mentioned when we got this batch of pretty fabric we thought the animal pattern of Nature Trail Curtain Fabric would be nice to use on a patchwork quilt… But the animal print is huge, as you can see, so not that fun to cut small squares for a quilt in. Instead we decided to make tote bags! For the front panel, we each picked our favorite creature from the print. 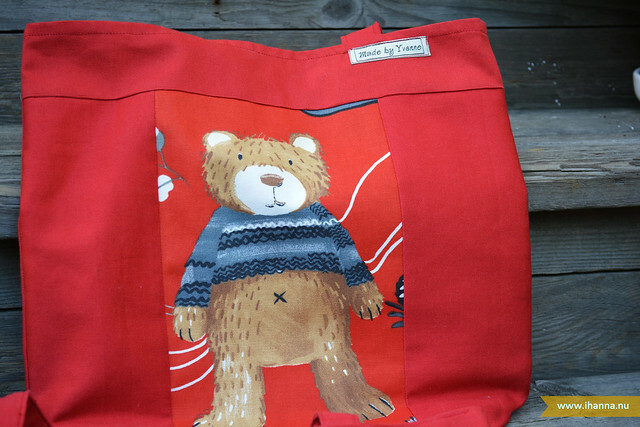 Then, in the plain Panama Red Fabric, we cut a backside for each tote, handles, and borders to “frame” the teddy bear and the owl piece with. You’d think making a tote would be quick, and it can be. But of course when my mom is involved in a project it gets more advanced than simply sewing two pieces of fabric together. 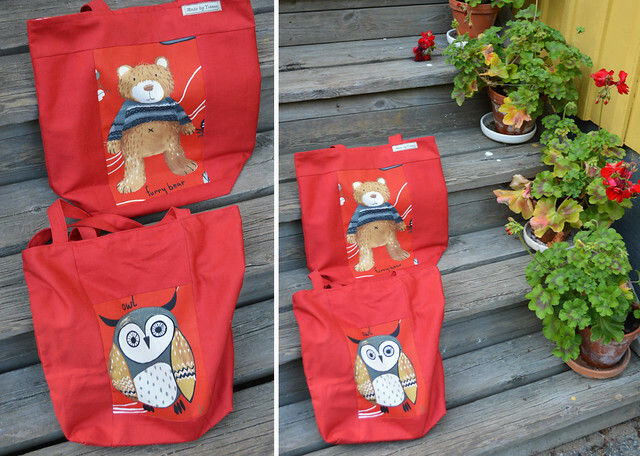 These totes has a cotton lining (made from an old stash fabric I bought years ago) and a pocket in each tote! When I posted our awesome bowling bags someone suggested I should offer them for sale, at a price of 15 British Pound (155 SEK or 24 USD). That might be a nice price for a fabric handbag – for the buyer. But as a maker, I’d just like to point out that at that selling price we would make about 1,24 pound (13 SEK or 2 dollar) per hour and person. That does not include tax, packaging, Etsy listing costs, exchange rate, the fabric or even the cost of the sewing thread! Not sure what a fair price for all that work would be, but not many would pay (or even be able to pay) for its real value. Those who can make a living of selling handmade are rare, and must be very prolific. I will never be one of them. Oh well, I’m keeping my bowling bag anyway. And my red tote! I like the “hanging inner Pocket” that we used here. 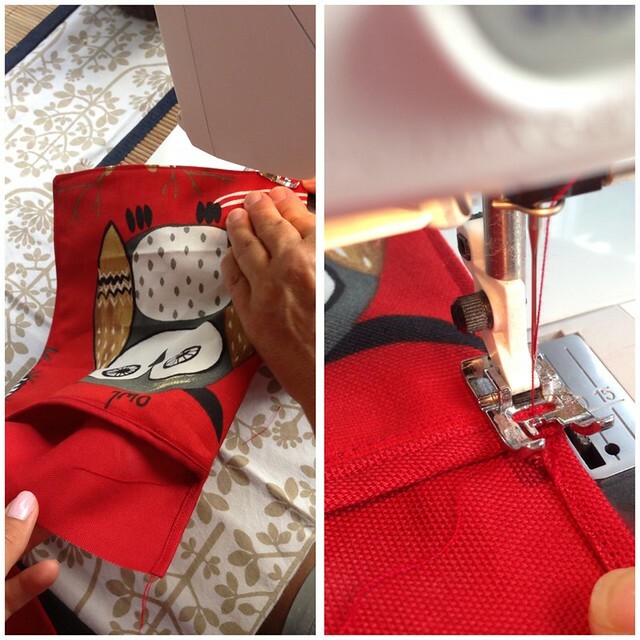 You create it on the side, and then pin it in place between the lining and the tote’s fabric. It creates the perfect place for your keys when shopping or bringing your craft project on a trip. 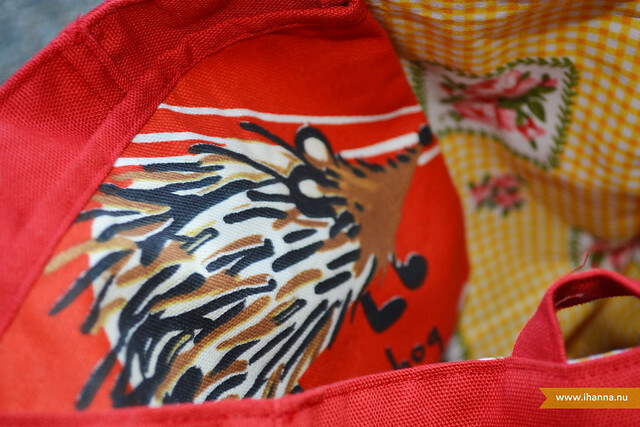 Cutest Hedgehog pocket ever, right? Mom is keeping her Teddy bear tote, of course. 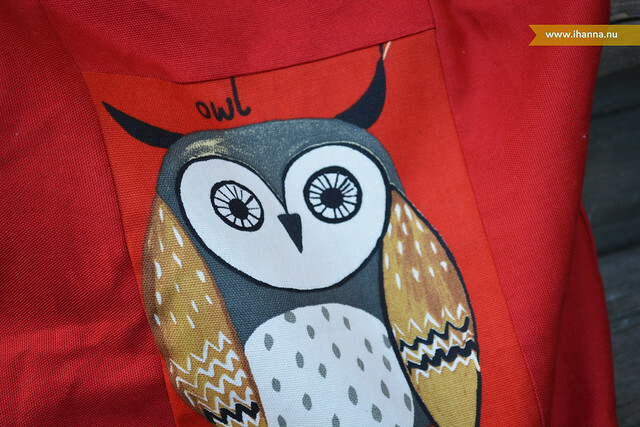 And I will enjoy my red owl tote for a long time, I’m sure. 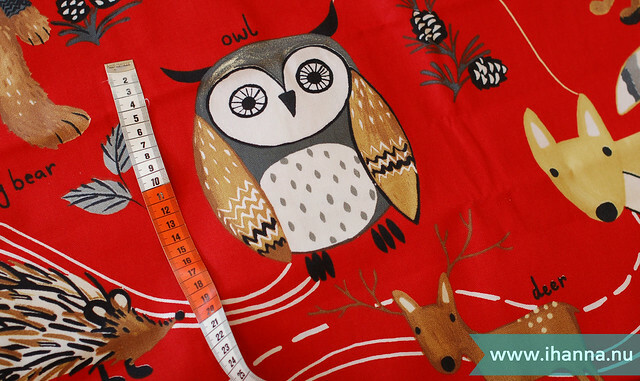 You can find both the Nature Trail (big animal prints with red background) and the matching Panama Red Fabric at the UK based online store Terry’s Fabrics. The Nature Trail fabric also features a fox, a tortoise, a deer, and a crocodile! Lots of tote potential, huh? Or maybe you’d make something else? 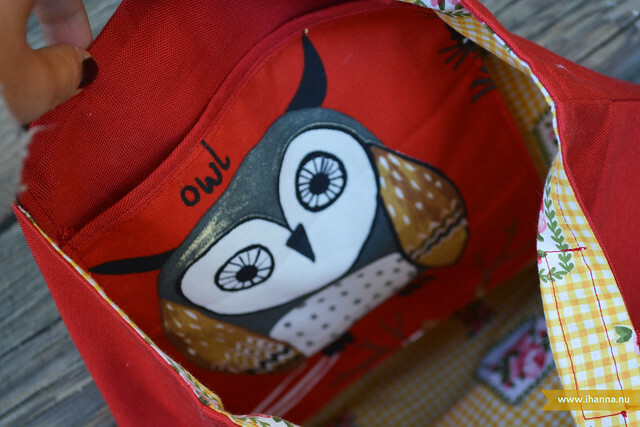 This entry was posted in A Creative Life, Fabric & Sewing and tagged crafty business, creating together, owls, sewing, teddy bear, totes and bags. Bookmark the permalink. Tror att jag har påverkats av alla ugglor som jag ser överallt och blir lite kär även i den här ugglan. Fin kasse!